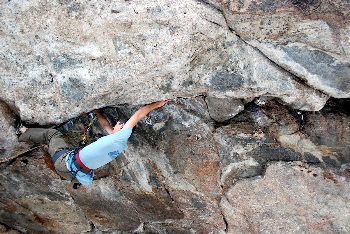 …the second pitch traverses out the underbelly of the roof for 30 feet of horizontal climbing to that downward lip. It’s hard 5.12 or easy 5.13 jamming to get off the belay, and then there’s a V10 cross into a mono finger-lock, followed by an all-out dynamic campus/throw to a flat undercling. Hard compression leads to a hand-jam rest, then some really funky, unique cross-over jams get you to the lip. Due to the difficulty Haas encountered working the route as well as the tenuous nature of the pieces protecting the hardest (and most dangerous) moves, the crux pitch was led on pre-placed gear. For a full first person account from Haas check out this post on Colorado MoJo. 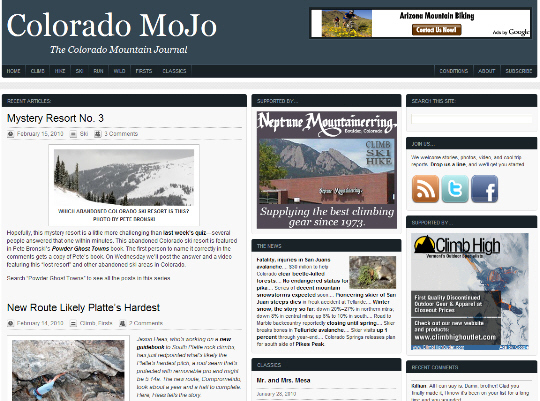 Created by former Rock & Ice editor Dougald MacDonald, the Colorado Mountain Journal (Colorado MoJo) is a great blog for stories about the Colorado backcountry including (but not limited to): skiing, mountaineering, ice climbing and of course rock climbing. You can read more about MacDonald’s motivation behind starting the site in this interview he did with AllClimbing. Congrats to Jason, always nice to hear good people being recognized for their hard work and successes. Thanks for the shout out, Narc. And to return the compliment: Your site is an absolute must-read. In the photo there is gear hanging, was this done on pre-placed gear? and I am curious where it is in the south platte?